Remy Sharp's cool site for HTML5 demos has a "View Source" button on each of the individual demo pages. Click it, and you see the entire source code for the page you are looking at. It's not a popup or a new tab, it just shows the source right there on the page. I thought that was cool so I set out to recreate it my own way. That will give us all the HTML for the page, excluding only the DOCTYPE and actual <html> tags. You could also access this through document.documentElement.innerHTML but hey, if we're gonna use jQuery let's just use it. We'll create a brand new <pre> element, and fill it with a "fake" DOCTYPE and html tags, and then drop in that HTML that we just gathered from the page. A few quick considerations with that gathered HTML: 1) Let's escape the <'s so they show on the page correctly without trying to render as actual HTML. 2) Let's "linkify" any links it finds so they can be clickable (taken in part from here). Then we'll place that newly created <pre> inside our #source-code div. Closing the source code is deliciously simple. Since the "View Source" button, when clicked, adds a hash-tag to the page, that means that the "Back" button in the browser will work. 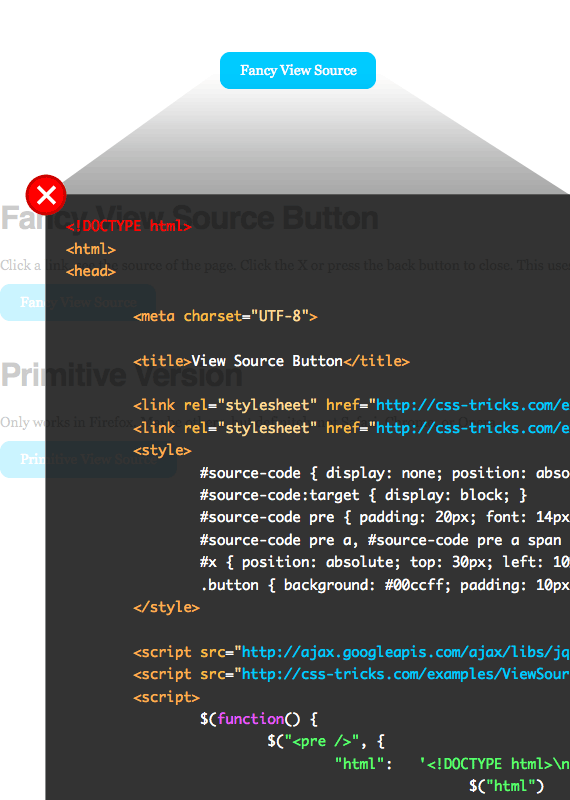 Pressing it removes the hash tag, thus #source-code is no longer :targeted, and it is automatically hidden by CSS. The #source-code div also has within it a simple "X" graphic, which links to the hash tag "#", which has the exact same effect. This just links to "#", which takes our source viewing element out of :target, which instantly hides it. and call the prettyPrint() function when the page is ready. They recommend adding an onload to the body tag, but since we're using the jQuery DOM ready function, we can just call it inside there. Prettify works by wrapping parts of the code in spans, which colorize that part. Also notice the properly escaped characters. Pretty much everything modern, as long as it supports CSS3 :target. Breaks in IE 8 and down, but OK in IE 9. If the hash tag is gone or has changed, remove the class name from the body (hiding the <pre>) and cancel the timer. Of course, feel free to use this however you would like. In its current form, this code relies on certain markup on the page, namely the button itself and the #view-source div. This could definitely be converted into a plugin which appends those things automatically which would make this much easier to implement. I may do that eventually. This also has me thinking that 1) I really need to get on putting in syntax highlighting back into the blog design itself here on CSS-Tricks and 2) I should do this View Source thing on all demo pages. Both of those things will get done in time. Another thing that would be cool is to bookmarkletize this. That would be especially cool for Safari which has crappy View Source (although there is an extension to fix that). Still, none of the browsers do view source in a modal window, which I think is sometimes nicer than opening a new window or tab. This is actually an awesome solution. A lot of times I find that source code written on tutorials or within posts can look a little messy or broken. This is such a fine alternative, thanks dude. In FF, when you scroll down the modal, the text becomes all blurry. Just my initial guess but I believe it’s because of the transparency. Awesome stuff! I will definitely be using this at Perishable Press. Thanks for sharing with us! Also, check the download link – I was getting a 404.. This is great, more really useful stuff. Especially the fact you have presented a number of methods to accomplish a similar goal. You’re “fancy” method seems to struggle when Modenizr is also in use though; Modenizr appears to add a fair chunk of ugly looking code (mostly an @fontface data string) to the head of the page at some point. By using jQuery to append the html on DOM ready it picks this up. Not a big issue, but I thought I’d mention it in case anyone else was wondering where the big ugly chunk of code was coming from. Hey Chris, nice to see my own work decompiled (for a change). You’re absolutely right about this: “He could have used the hashchange event” – I really wanted to use that (and I may still use that and defer to a timer), but again you were right, in that I wanted to support more browsers – and since the view source was likely to happen for only a few users and once on the view source “view” they wouldn’t be doing much, I figured a timer was fine for the job. edit: Actually after readong this, I see it is saving it on page load. But you could do it on demand if you wanted and have a view source button that showed the current state of the page. Nice work Chris. Like this a lot. This is incredibly useful Chris. Thanks! Very cool deconstruction – both very valid methods. Just goes to show there’s often more than one right way to do something..
Fluff. Why re-invent the wheel? Every browser already has the ability to view source, so aside from unwanted code bloat and the, ‘ooh look, shiny!’ effect, what’s the point? If you’re using this as a demo of the pseudo :target selector then that’s fine, but I wouldn’t advocate that anyone actually use this. Hope that’s of some use to someone else. In reality this functionality should be part of the browser and finding a solution to the problem of a browser lacking basic functionality shouldn’t be left up to web developers, but rather the browser developers. Riiighht. Like the PNG fix for IE. Or Web Sockets flash shim. Or any of those other techniques where web developers have created solutions for a browsers lacking functionality. Really great tutorial, thanks for sharing! This is a great way to show your source code. Nice article Chris! This will be perfect for those wanting to check out my code without using the view page source in the browser. I plan to incorporate this into my portfolio of my website in my next round of updates. All right then. I’m stealing this asap for my demo pages. Good write Chris. Time for you to look into regular expressions me-thinks. This one converts and urls in the source in to clickable links. Damned powerful things when used correctly! Is there possibility, to add an external link to show the source ? Really nice one. keep it up. Great source of inspiration. Old trick but with new features COOL. thats really great trick. I ll try & use. thanx..
WHAT FONT DID YOU USE IN THE PICS!?! Ive been looking all over for it, but icant find the font! Good tutorial,thanks for sharing i will try this code at my website too. Hope will work. thanks for the cool script. I can use it in many place. Really very great Information… and very great solution, thanks for sharing!!! I don’t like that if I view source, then close the popup, then hit the back button (in attempt to actually go to the previous page), the popup pops back up. I understand it’s because of the hashtag and :target pseudo-element; just saying this one annoyance prevents my enjoyment of it. If there’s a way around it, I’d be interested. Can anyone please explain me how to make a view source button like a syntax highlter use for <pre> tags ? for olld technology or system specifications from years earlier. Then how to rip DVD wirh Mac – X DVD Ripper Free Edition. See the section below on more information on why some discs fail.